GBP/NZD trades 0.48% higher on the day at 1.9097 at 0845 GMT. 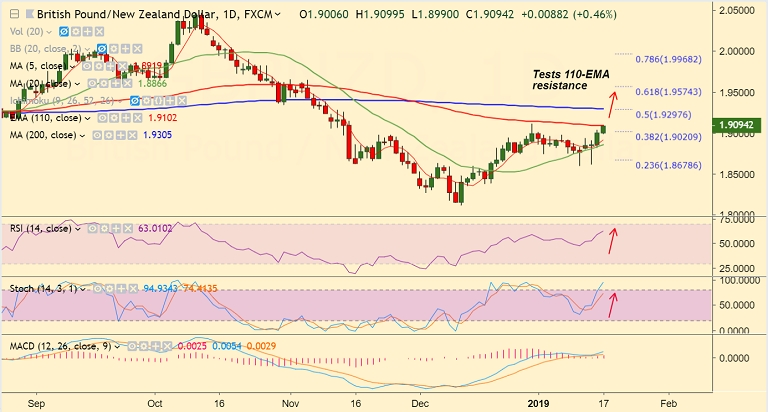 The pair has tested resistance at 110-EMA at 1.9102, break above to see further gains. Technical indicators are biased higher. Stochastics and RSI are sharply higher. Price action has broken above 55-EMA and 38.2% Fib. Break above 110-EMA eyes next major resistance at 200-DMA at 1.93. Immediate support lies at 5-DMA at 1.8918. Break below 21-EMA to see downside extension. Call update: Our previous call (https://www.econotimes.com/FxWirePro-GBP-NZD-recovery-capped-at-55-EMA-further-gains-only-on-break-above-1485261) has hit TP1/2. Recommendation: Book partial profits at lows. Hold for further gains.